A rectangle can be cut into several pieces which, after translation and rotation, combine into a square of equal area. The applet only demonstrates this fact for sufficiently elongated rectangle. 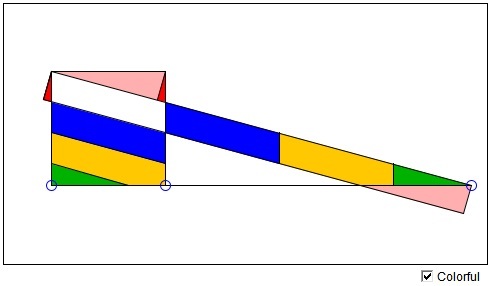 Rectangles that are nearer a square to start with can be cut into strips that combine into rectangles of the sort the applet handles well, i.e., in which the length is at least twice its width. Since every triangle is equidecomposable with a rectangle, we can also claim that every triangle is equidecomposable with a square! An even more obvious conclusion is that two rectangles of equal area are equidecomposable. This fact can be established directly and likely in a more economical manner.